Interested in sending out your own Newsletter? Dream, Design, Develop LLC can help you create a newsletter customized especially for your business. Learn more here. Here is an example of our website marketing newsletter. 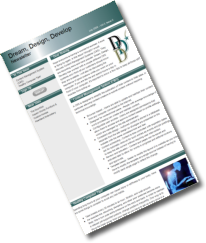 Dream, Design, Develop LLC provides a quarterly e-newsletter. The newsletter includes featured sites, internet tips, latest website trends, website tips, and more. We try to include information that the every day internet user will find useful and interesting. It also lets you know what we have been up to and what exciting websites our clients have allowed us to develop recently.